Nothing speaks new beginnings like spring. Spring is a time of rebirth and awakening, and so the perfect time for weddings. Not only is spring the perfect season for weddings symbolically speaking, it is also perfect in terms of weather. Your wedding is by far one of the most important events in your life and planning it is very demanding. You want your day to be perfect and, most importantly, to reflect you and your soon-to-be husband. You want to feel beautiful, comfortable and loved. Sometimes it is hard to know what or what not to choose, given the fact that most of us are not exactly experienced in wedding planning. To help you, here are some popular wedding trends for spring. Flowers are quintessentially spring; they are everywhere, especially tulips and lilies, which seem to be an all-time favourite in spring wedding bouquets. A bouquet is a must and, with all of spring’s vibrantly coloured flowers, many brides take the opportunity to include at least one or two in their bouquet. Think yellow, orange, pink and violet; blue seems to be popular too. Whether reflected in flowers, centrepieces or bridesmaid dresses, spring weddings are all about that pop of colour. They often embrace the season and the emerging flowers. 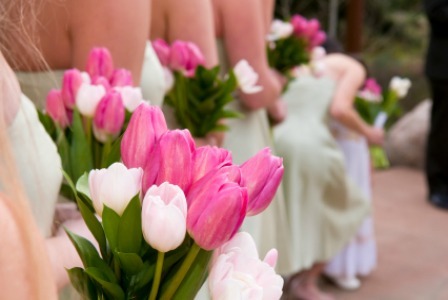 And just like the blooming tulips, spring weddings open up those who are present to beauty, warmth and romantic colours. Flowers, plants and leaves are essential to spring weddings. Leaves and flowers are often incorporated in plate designs, candles and decorations. It is also not unlikely to see plants and leaves in centrepieces. They add a very natural and chic feel to the wedding, especially when the whole theme is about embracing the season. It is hard to plan an outdoor wedding in the midst of winter, and sometimes fall can be unpredictable with its blowing wind and flying leaves. Summer is always fair game, but can often be too hot for brides, especially big-skirted and frill-loving brides. Spring is the perfect season to have an outdoor wedding without having to worry about snow or winds. Spring weddings capitalize on just the right mix of sun and breeze.